sharp edge for a long, long time ..
brass-lined, unbreakable handles . .
pocket kn·ife in all Sea·rs history. (long clip, sheep-foot, spay). 4 in. long. Shipping weight each 9 oz. clip, sheep-foot, spay). 4 in. long. pings; pen, file, screwdriver blades). Stainless steel handle. 2Ys in. long. and it will be replaced absolutely free. that operates in a minimum of space. 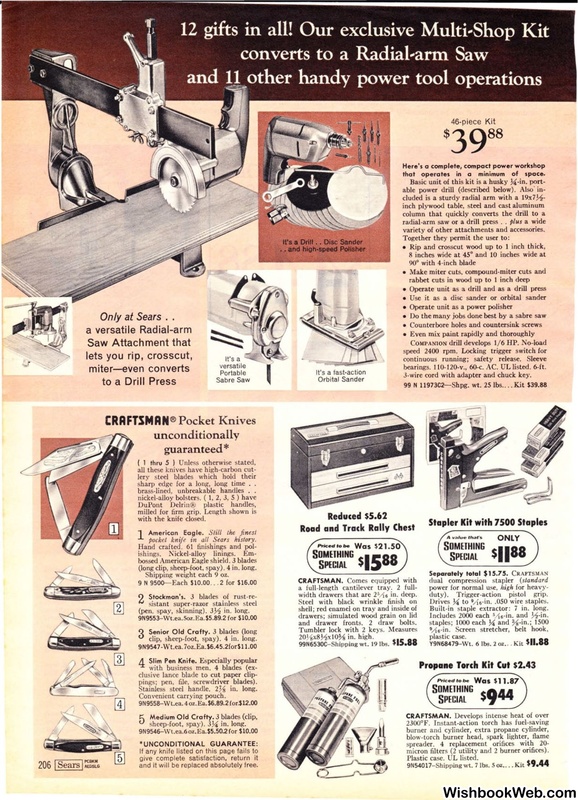 radial-arm saw or a drill press . .
variety of other attachments and accessories. bearings. 110-120-v., 60-c. AC. UL listed. 6-ft.
3-wire cord with adapter and chuck key. and drawer fronts. 2 draw bolts. Built-in staple extractor: 7 in. Jong. micron filters (2 utility and 2 burner orifices).